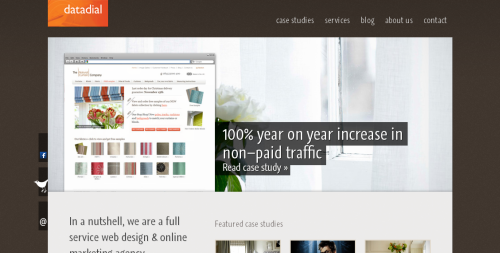 One of the most impressive parts of the Datadial site is the long list of case studies. Each one of them explains in great detail the sometimes outstanding achievements of a particular website they have worked on. Many low level SEO companies are afraid to show their results for fear of peer review. Not here, Datadial is one of the most open agencies when it comes to show off ongoing and finished projects. Datadial has been on my radar for a year already. They have created one of the most popular SEO infographics among others and they publish a high quality blog with unique thought provoking posts. Additionally I follow Matthew Sawyer, the head of SEO and Digital Marketing for more than year. I followed him back then because he shares just the best SEO and social media related links and I consider him a valuable source of my daily reading list. I’m not alone. He’s probably one of the most successful search and social media experts in the UK and has a substantial following on Twitter not just by the sheer numbers. Datadial itself is active as a company in the social media arena as well. They have a Facebook page and a corporate Twitter account you can like or follow. Datadial consists of a team of 16 people and is in business since 1998. ← What Are the Core Values of Your Blog? What Do You Stand for?